The candidates must have studied Physics, Chemistry and Mathematics as main subjects during their II PUC / 12th Standard. Candidates who have studied Biology, Statistics, Electronics, Computer Science, etc., in addition to Physics, Chemistry and Mathematics are also eligible to apply. NEET-UG: Appearing in 2019 and securing a minimum of 60% (GN), 54% (OBC-NCL), and 30% (SC/ST/PWD). Reservation for SC/ST/OBC/Person with disability (PWD) and Kashmiri-Migrant (KM) candidates: will be as per Government of India regulations. 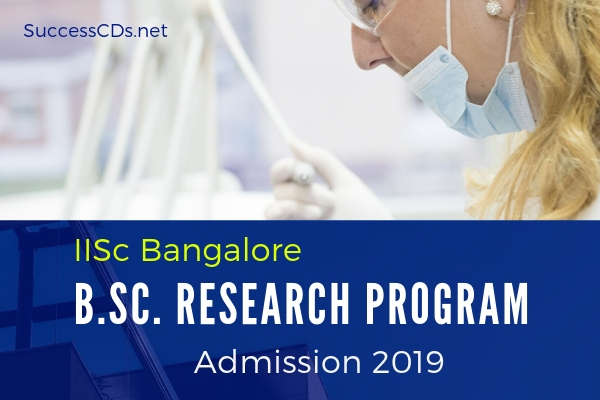 The online application may be filled and submitted by through the IISc website www.iisc.ac.in/ug from 01 February to 30 April 2019. Payment option: Online Payment - Net-banking, Visa Card/ Mastercard, Debit/Credit Cards.